Unlikely you'll want to use the steam turbine electricity generator in a Renewable Biosynfuel Factory environment. 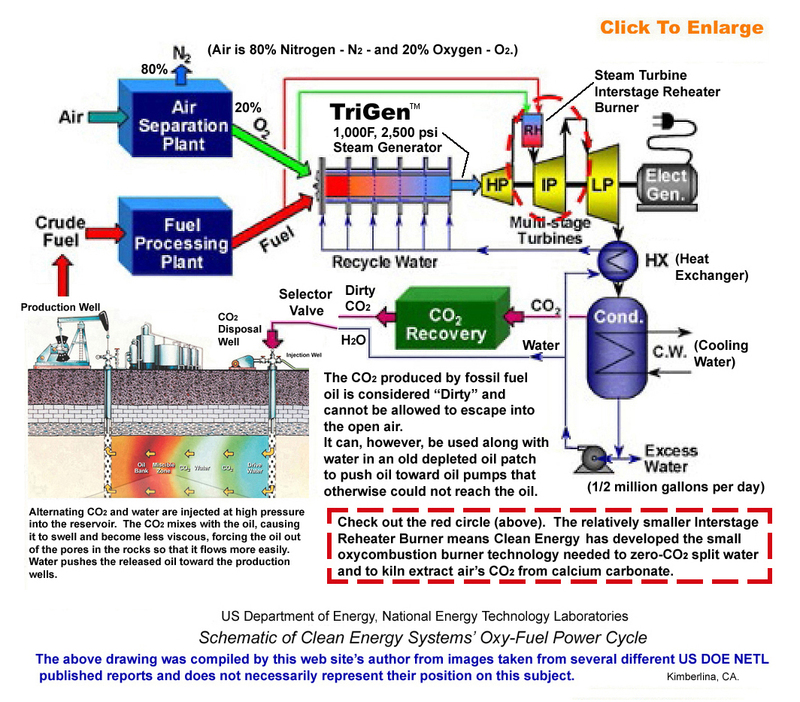 Just delete it and use the heat for carbon capture's reboiler and process heat. 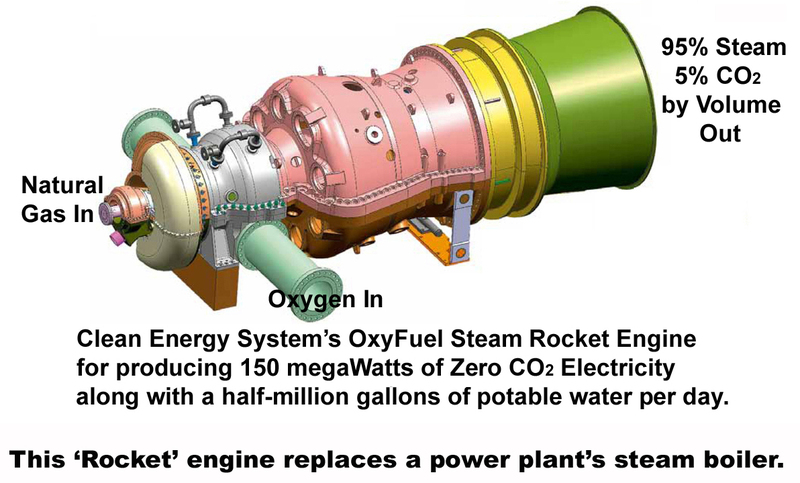 Oxyfuel carbon-capture produces 100% carbon-capture, making it as clean as a wind turbine. 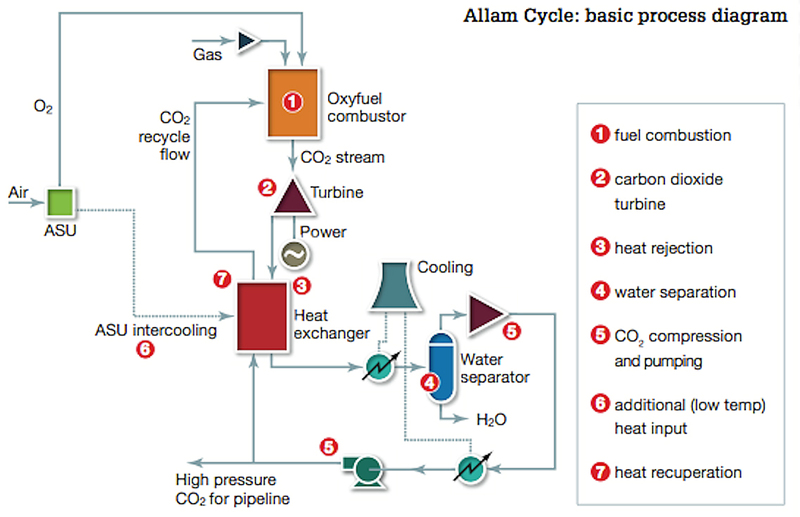 Another, perhaps more promising and more efficient, oxy-fuel approach would be the Allam cycle. Below: Close, but no cigar! 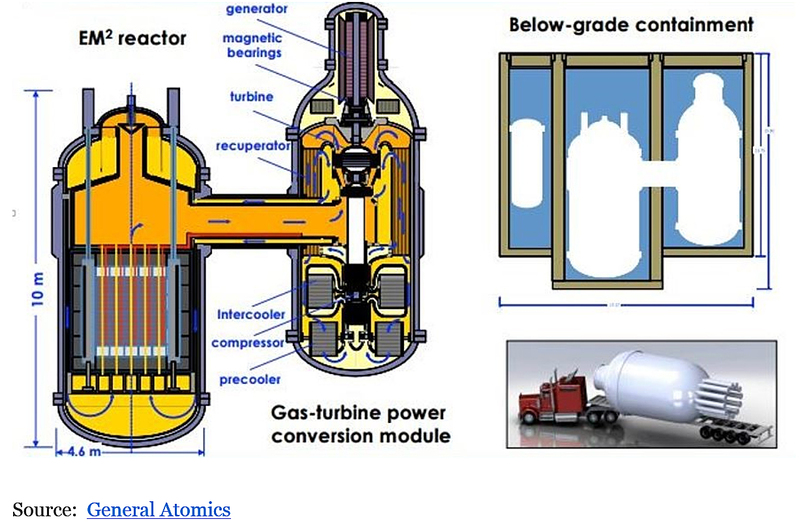 (Below) How a recuperator was used in a helium cooled very high temperature prismatic TRISO-powered fast-neutron nuclear reactor. Michigan is the #17 oil producing state. Some of Southwest Michigan's unneeded coal power plants (think B.C. Cobb) are sitting directly above some of the world's best CO2 sequestration strata. All the plant needs to do to dispose of CO2 is to drill straight down several thousand feet to make a CO2 disposal well. 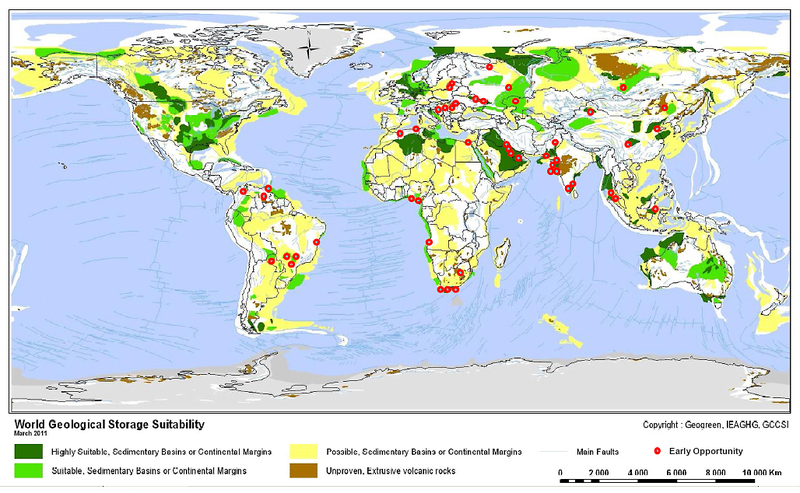 Known global CO2 disposal locations. Viscosity is one of the key parameters used when evaluating liquid fuels for use in industrial gas turbines and generallyshould be <10cst (most regular diesel fuels <7.5cst @ 40degC). Crude oils need to be treated in order to meet industrial gas turbine limits on metallic and other contaminants in the fuel. 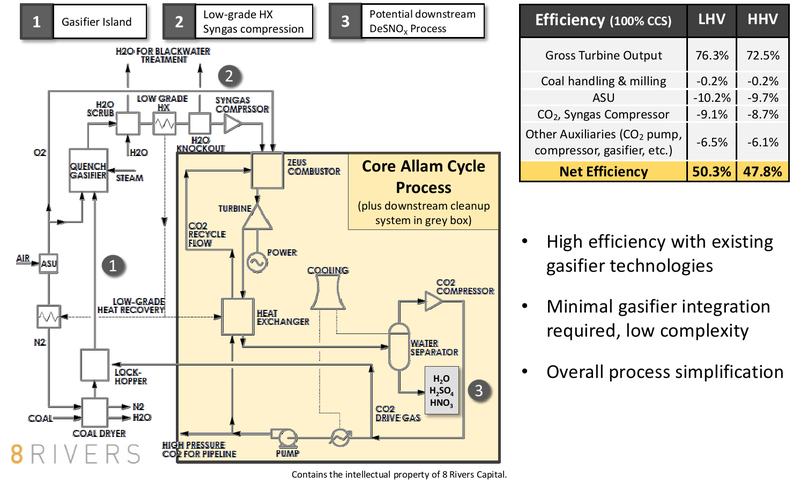 Crude oil often contains high amounts of alkali metals (Na, K) and heavy metals (V, Ni, etc) which if introduced into the combustion system can result in accelerated deposit formation and high temperature corrosion in gas turbine hot gas path components. Major corrosive constituents include Vanadium pentoxide (V2O5), sodium sulphate (Na2SO4) and aggressive low melting forms in the Na2SO4 – V2O5 and Na2O-V2O5 systems. Determination of the ash sticking temperature is usually a good feature to use, and should be >900degC if sticking to the blade is to be avoided. Water and sediment can be removed, or reduced, by filtration and centrifuge separation. This is the same for any liquid fuel, and prevents the formation of corrosive elements and bacterial growth, a pre-cursor to fuel degradation. Removal of the water also reduces the levels of water-soluble contaminants such as the alkali metals sodium and potassium. Vanadium and other heavy metals are oil-soluble though, and can only be treated through chemical dosing so that combustion creates high melting temperature compounds. Crude oils can also contain more volatile components with a low flash point therefore the need to include explosion proof equipment is often required. This facility is clearly defined by the U.S. Nuclear Regulatory Commission, local and national building and electrical codes, and supplemented by constraints from the relevant equipment manufacturers. Many countries and regions have only tiny or depleted oil patches (i.e., like Michigan), lack advanced energy infrastructure, and need something like Hybrid CO2. 1. CO2 emissions can be reduced to near-windmill levels by adding amine carbon capture to the turbine's exhaust (somewhat like adding a catalytic converter to a car). 2. Substantial reductions in the cost of plant energy since you are making your own Enhanced Oil Recovery (EOR) CO2 and burning its unrefined crude oil. 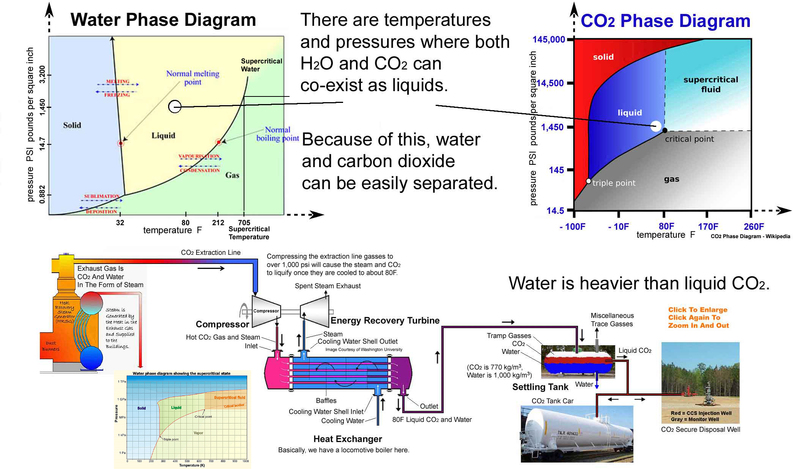 CO2 is used two ways in the above Hybrid CO2 Energy Park. 1, In a carbon-neutral fuel-product loop where plants extract CO2 from the air, the carbon (the ‘C’ in CO2) is extracted from the plants and used as one of the essential ingredients (carbon carries the hydrogen in hydrocarbon combustion fuels) to make synthetic gasoline, diesel, jet fuel, etc. 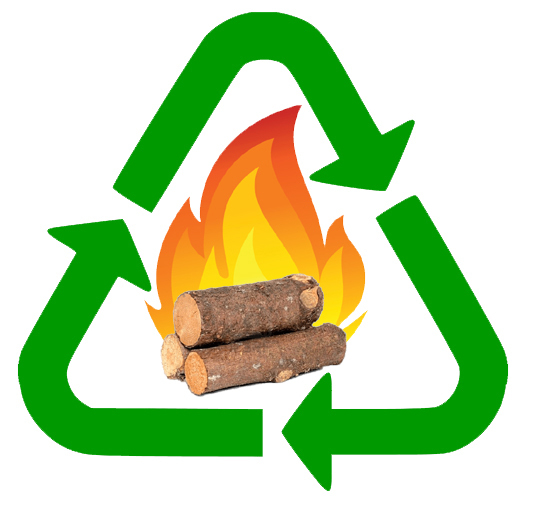 When the vehicle exhausts the burnt fuel's CO2 back into the air, this creates an energy cycle that does not add to, or reduce, Climate Change. 2. 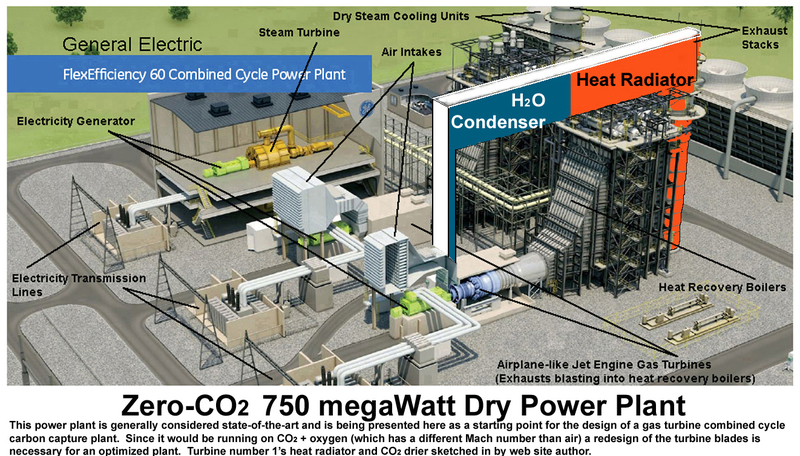 Using CO2 for ‘Enhanced Oil Recovery’ to power the Hybrid CO2 Energy Park itself. In most parts of the world there are trace oil patches that cannot be profitably pumped because the oil is attached to rocks and won’t flow easily by itself. The Permian basin oil patch in Texas is an example. For instance, Michigan is the U.S.' 17th largest oil producing state. Many of its wells are 10 barrels-a-week 'strippers'. It so happens that liquefied CO2 acts as a solvent when mixed with crude oil. Oil companies pay good money to buy tank cars full of liquefied CO2 and inject it, along with water, into the ground in a circle around underground patches of oil. This loosens the oil from its surrounding rocks and the water pushes the now loose oil toward oil wells located in the circle's center. These oil wells pump the oil and CO2 mixture to the surface and into tanks. The CO2, being a gas under pressure, bubbles to the top of the oil where it is recaptured, then recompressed to re-liquefy it, and then is injected into the ground again. Not all of the oil is recovered and, after several trips up and down, the CO2, unable to free up all the oil every time, is lost (sequestered) underground forever. Typically, one barrel of CO2 will get you about 5 barrels of crude oil before the CO2 is completely absorbed by the ground forever. A small single unit coal power plant located over a prime Carbon Capture disposal strata in Michigan.